Being involved in car accidents can be devastatingly life-changing. It can lead to acute and chronic injuries that cause a huge disturbance in your day-to-day life. One of the most common conditions that car accident injuries lead to would be whiplash-associated disorders. 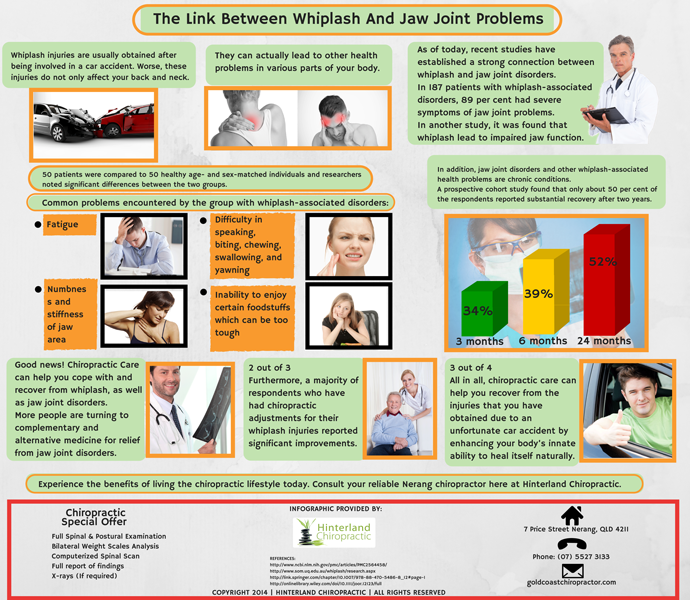 What makes matters worse, whiplash injury to the neck can also lead to other health concerns, including jaw joint disorders. A huge body of studies have established a strong link between these two conditions. Given the severity of the problem caused by jaw joint disorders, whiplash, and other injuries brought about by car accidents, one might think that is can be too difficult to cope with and eventually treat the situation. On a positive note, your trusted Nerang chiropractor here at Hinterland Chiropractic can help you recover more efficiently through all-natural, safe, and gentle chiropractic care. Experience the many benefits of top-notch chiropractic care today. Chiropractic can boost your body’s innate ability to heal itself naturally. Here at Hinterland Chiropractic, we aim to provide families on the Gold Coast with the very best lifetime family health care. Call us today on (07) 5527 3133 or book an appointment online to avail of our chiropractic special offer.